The Servlet Basic Authentication Annotation Example explains how to configure basic authentication annotation with a Java Servlet. 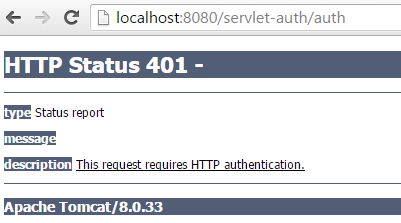 With basic authentication of a servlet, the web browser presents a standard login dialog that is not customizable. When a user submits his or her name and password, the server determines whether the user name and password are those of an authorized user and sends the requested web resource if the user is authorized to view it. His or her name and password automatically gets Base64 encoded which do not mean that it is safe. Base64 encoding can be easily decrypted. This is tenth post of series of Java Servlet Tutorial. This series tutorial will provide you full knowledge about Servlet 3.0. We are using Tomcat 8 to do the Basic Authentication Annotation configuration for this example. We use tomcat-users.xml file to register a username/password combination with the appropriate row. This file is located at ../apache-tomcat-8.0.33/conf/tomcat-users.xml. 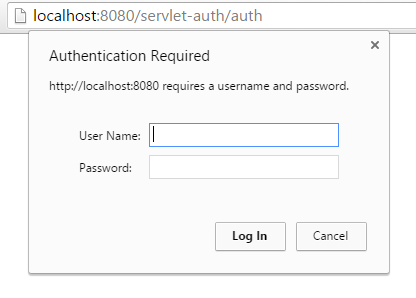 That’s all on how to build a Servlet Basic Authentication Annotation Example in Java. Hope that it is useful to you. You can also find other servlet example in the series of Java Servlet Example. I download your app but not working! Which problem did you get?